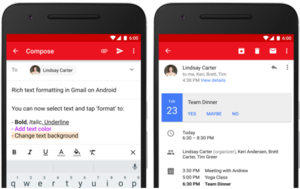 With more people using email on their phones, Google has finally added two key editing and calendar features to its Gmail app for Android. 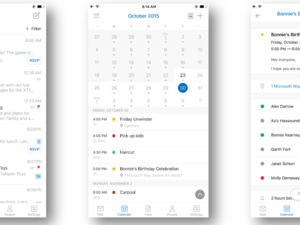 Now, when users get a calendar invite from Google Calendar or Microsoft Exchange, they’ll be able to hit a button in their app and get the event added to their calendar, without having to switch applications over to Google Calendar. Where the resulting event ends up depends on which email account someone is using. Those folks viewing their Exchange email accounts inside Gmail will have the event sent to their Exchange calendars, and people who are looking at a Gmail account will have the event added to Google Calendar. In addition to the scheduling update, Google also added rich text formatting to the app’s composition screen, so users can now make text bold, italicized, underlined or highlighted on their phones, like what they can do on Gmail’s Web interface. The two features are good news for Gmail users, and also an important competitive move for Google, since other email clients on its platform already support similar functionality. 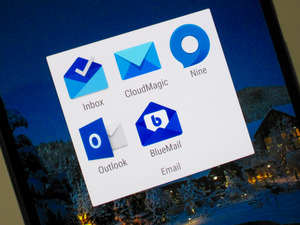 Google has the advantage of getting Gmail pre-installed on most Android devices, but the company’s app still needs to remain competitive with other email clients in order to avoid driving people toward applications from competing businesses like Microsoft.